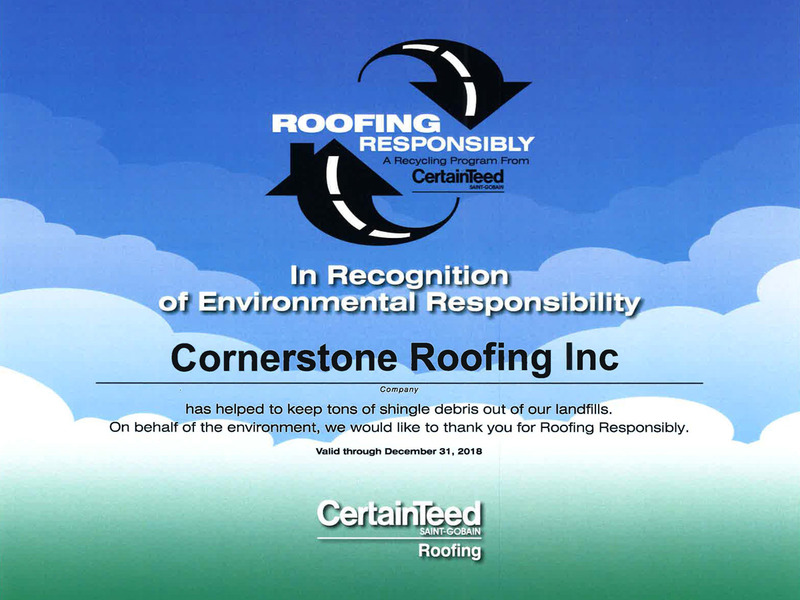 CertainTeed Roofing Responsibly Recycling Program Contractor - Cornerstone Roofing, Inc.
Just received our CertainTeed Roofing Responsibly Recycling Program certificate for 2018! Cornerstone Roofing, Inc. is glad to be a part of a program that has helped to keep tons of shingle debris out of landfills. Cornerstone Roofing is a CertainTeed Roofing Responsibly™ Shingle Recycling Program Roofing Contractor, which means we ensure your composition shingles are responsibly recycled upon tear off and turned into paving materials.